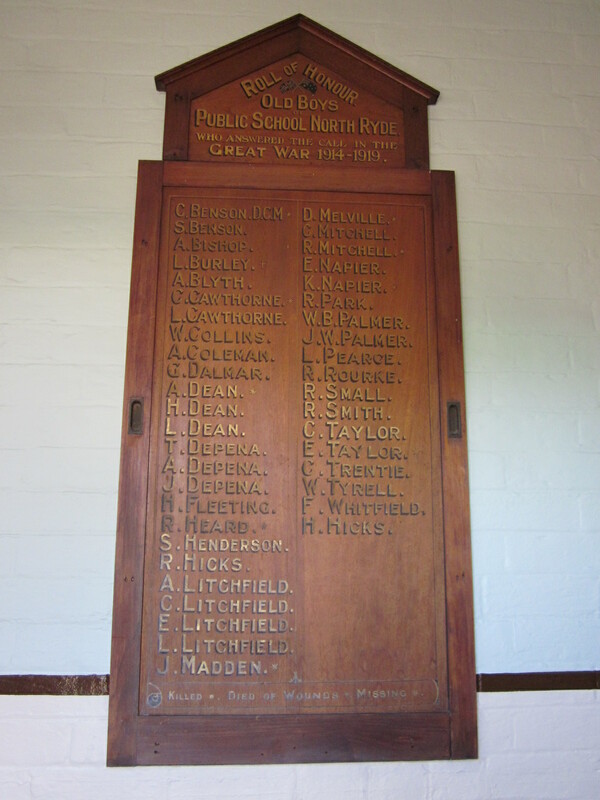 North Ryde PS ex-student, Captain Claude Elmhurst Benson’s name sits at the top of the North Ryde PS WWI Honour Board on display in the Schoolhouse Museum. Born in 1887, Claude grew up in ‘Bensonville’ Lane Cove Rd, North Ryde. He was a diligent pupil receiving dux of the school in 1897 and the prize for best attendance in 1898, missing only 7 of the 220 days of school. Working as a clerk in Townsville, fair-haired Claude enlisted on the 20th August 1914 at age 27 and was a member of the 9th Battalion, Australian Infantry. Within 8 days of enlisting he was promoted to sergeant. He fought in Gallipoli and France and was killed in action in a night raid near Saille, France on 16th July, 1916. Claude was awarded the Distinguished Conduct Medal (DCM) for ‘gallant conduct and ability’ and showing ‘great courage’ and ‘devotion to duty’ in the Dardenelles on 25th April 1915 (extract below). Heading to war with their former classmates and with their brothers, of the 43 ‘Old Boys Who Answered the Call in the Great War 1914-1918’ only 33 returned. See complete honour board below. Image of Claude Benson on Trove. Sources: Claude Elmhurst Benson on Roll of Honour Australian War Memorial, digitised WWI records from National Archives Australia.